Find lots of Halloween haunted houses in Ohio for 2018. Funtober lists all the haunted houses, haunted corn mazes, haunted hayrides, scream parks and more for your October enjoyment. Long has “Oh Hi Oh” been a sounding cry for those from the buckeye state. Each Halloween season those turn to screams of terror. Haunted attractions feature Hollywood type set designs, live actors, creative costumes, air blasters and more. Expect to find some zombies, witches, vampires, devils, and clowns among your local haunts. Besides the many haunted houses in Ohio you can visit you might want to take a side trip to Canton for the Pro Football Hall of Fame or Cleveland for the Rock and Roll Hall of Fame. But don’t let their apparent friendly nature fool you. Do you run a haunted house in the United States? More than 500,000 people came to Funtober last year looking for a haunted attraction to attend this fall. Please see our advertising page or contact us for more information. New name and all new haunt attractions brought to Columbus by the world famous 13th Floor Haunted Houses. Enjoy the fun starting September 21st. Doors open at 7:00 PM every Friday, Saturday, and Sunday nights. Also open most nights in October. Expect lots of scares with live actors in professional make-up working hard to make you jump out of your skin. Tickets available at the box office or online. Get ready for the most fun you’ve ever had getting scared this Halloween season when the world-famous 13th Floor Haunted House comes to Columbus! In most buildings, the 13th floor doesn’t exist–but here, in Columbus, it’s terrifyingly real. Located in the Northland Plaza Shopping Center, the legendary 13th Floor has been praised by and featured on America Haunts, Travel Channel, MTV, Haunt World Magazine, and USA Today calls it “One of the best haunted attractions in the US. TICKETS & INFORMATION: Purchase tickets early as Columbus’s largest haunted house is expected to sell out! Located in Northeast Columbus at the Northland Plaza Shopping Center. Their haunt season begins on September 21st. A new name and now 7 great haunted attractions. They advertise themselves as the largest haunted event in the world. Tickets are $28 online. Doors open at 7 pm and close at midnight on Friday and Saturday or 10 pm on six other nights. 7 Floors runs every Friday and Saturday night through October plus a couple added dates near Halloween. 7 Floors of Hell has over 65000 Facebook likes. Extremely scary fun begins on September 28th. Located at the Blossom Music Center ask yourself are you afraid of clowns? The Carnival of Horror attractions are Insane Asylum, The Fun House, The Wicked Woods, and The Freakshow 3D. Visit any Friday, Saturday, or Sunday night in October. A ticket is $22-23. The times are 7:30 pm until midnight on Friday and Saturday or 10 pm on Sunday. There is a food court onsite. Carnival of Horrors has over 27000 Facebook likes. Lots of fun begins on September 14th this fall. Hallow Weekends has run for 20 years of monster fear. Cedar Point operates 10 haunted houses that are free with the park ride admission. Hallo Weekends hours are Friday night from 6 pm to midnight. Saturday runs from 11 am to midnight. Note the park operates their daytime Great Pumpkin Fest on Saturday and Sunday the same weekends. Check the website for a variety of ticket price options and discounts. Opening night is September 21st. The Factory of Terror with 160,000 square feet is advertised as the “World’s Longest Haunted House.” It takes about an hour to go through the four attractions. A $25-30 ticket admits you to the Portal To Insanity, Industrial Nightmare, Massacre on Mahoning, and Judgement Day in 3D. Attractions are open Friday and Saturday in September and every Friday, Saturday and Sunday nights in October. The times for Sunday are 6 pm to 9 pm. The times for Friday and Saturday are 7 pm to midnight. Check web page for additional open dates. You can wear costumes however masks or makeup are not allowed. This very popular attraction has over 79000 Facebook likes. It all begins on September 28th. Fear Forest has two haunted attractions plus a great haunted hayride and cornfield. It is open Friday, Saturday, and Sunday. Fear Forest opens at 7 pm and closes at 12 am on Friday and Saturday and at 10 pm on Sunday. A ticket for the hayride is $10 per person. Buy a combo ticket to go through Insanitarium, Psycho Path Haunted Trail, and ride the hayride for just $25. More combo packages available. The hayride is 1 mile long. They have 68 acres of sheer terror. Experience Fearanoia and Cagemaze at the Fortress of Fear Screampark. Park is open from 8:00 pm to 11:00 pm on Friday and Saturday nights or 10 pm other nights. Halloween is black-out night. The fear begins on October 5th. This is a family haunt that runs the week before Halloween. Its been operating for over 26 years. This year it is open on 9 dates beginning October 20th. An annual haunt for over 18 years. It features a haunted barn, corn maze, and haunted hayride. They have vendor concessions and lots of live entertainment on select night. Doors open at 7:30 pm and runs until 11:30 most nights. Experience the fear of the evil on the farm. Hear tales of mass murder, torture, and what ever happened to the Wilson family? Find out if you dare. Open Friday and Saturday nights in October beginning September 28th. Their season begins on Thursday, September 20th. Haunted Hoochie is advertised as “The Worlds Most Extreme Haunted House”. This is a strange haunted attraction that is working hard to make you sick. This is not your typical haunt attraction. It is very “hands on” and you should expect to be touched, grabbed, and maybe even choked or dragged. The unusual house opens Friday and Saturday from 8:30 pm until after the bars close. Thursday from 8:30 pm to midnight. While there check out the food and souvenirs. So it is open Thursday through Saturday nights. Check Facebook for details. Haunted Hoochie has over 108000 Facebook likes. Attractions opens September 28th. This place is incredible. The Haunted Hydro has been unique for 27 years. The theme is based on movies of the Silver Scream. The two attractions are the classic Haunted Hydro themed “A Night at the Os-SCARES”. The second attraction is Crazy Bob’s Santarium & Psycho-path. Also they have a live preshow on the midway called Ghoul-A-Bration. Also enjoy the food concessions and fire breathing fright. Doors open at 7 pm and close at 11:30 pm on Friday and Saturday and at 10:30 on all other nights. Tickets available for multiple attractions. As a real haunted house they also offer the opportunity for 4 – 10 people to stay overnight each night in October as part of their Ghost Hunter Overnight Package. 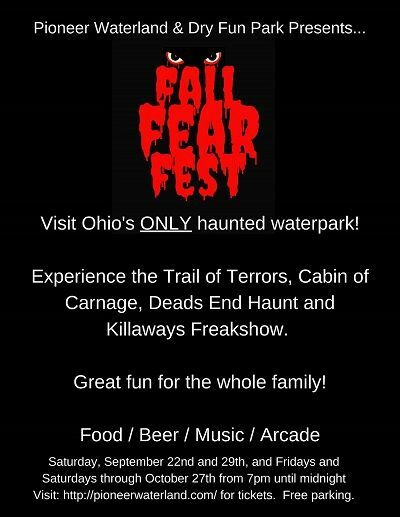 This popular haunt is open for the season on September 21st. Open for more than 40 years the Haunted Schoolhouse and Haunted Laboratory has a combined 7 floors of terror. The haunt is a classic in the industry and still supports 50 actors providing lots of frights. It is open every Friday and Saturday nights after September 21st plus plus most Sundays and some Thursday nights. It opens nightly at 7:30 pm and closes at midnight on Friday and Saturday or 10 pm on other nights. Opens for their season on September 21st. The Hudson Jaycees have been sponsoring this attraction for the last 46years. Ticket prices are $12 but specials are available. Open Friday, Saturday, and Sunday nights through Halloween. Two attractions open on September 28th. Ghostly Manor and Lake Erie Fearfest. They run every Friday and Saturday nights plus some Sundays through Halloween. Tickets are $22. Opens nightly at 7:30 PM. It is a monster infest maze and terrifying yard. An annual charity haunt put on by the Portsmouth Jaycees. Attraction opens October 5th. New location. Tickets are $20 to the night time Haunted Woods. Food vendors and a gift shop are onsite. The box office opens at 6:30 pm while the attraction starts at 7 pm and closes at midnight on Friday and Saturday, and 10 pm on Sunday. The spooky fun begins on September 22st. New haunt attractions for 2018. Spooky Ranch has five haunt attractions for one low price. It has operated for over 28 years. The attractions at Spooky Ranch are Crazy Clowns 3D, The Famous Haunted Hayride, The Haunted Barn, and Funny Farmhouse, and the all new feature attraction Bloody Mary’s Revenge Haunted House. Tickets are $25 for the most popular 5 attraction combo package. Gates open at 7 pm. Attraction closes at 11:30 pm on Friday and Saturday or 9:30 pm on other nights. It operates every Friday and Saturday nights in September plus most Thursday through Sunday nights in October. During the day you can visit the Old West Pumpkin fest running from noon to 5 pm. 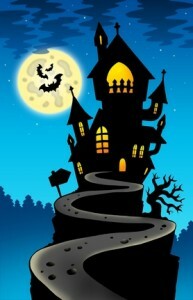 There is a family friendly Halloween trail with most attractions being suitable for children. Their season begins on September 22nd. Experience The Ride, Terror in the Corn, Nightmare Penitentiary, and Slaughter Hotel at one of the state’s top haunts. Don’t miss the excitement as fire breathing Semi’s chase unsuspecting victims. The attractions are open every Friday and Saturday nights. Get all four haunts for one low $25 “combo” price or buy them as individual tickets. Sorry, cash only. VIP available. Ohio borders a number of other states with a lot of haunted houses. So you might also want to consider the haunted attractions in these states in addition to the Ohio haunted houses. Have you been to one of these haunted houses? Future readers would be interested in hearing what you thought. Did you have a great experience? Was it worth the money? Would you suggest it to visitors here? Any tips to maximize your experience? I’ll gladly publish what you send me and give you a great big hug. This October, 4 legendary haunts unite with newly renovated, Ghostly Manor, as seen on The Travel Channel’s “Best Places I’ve Ever Been”. 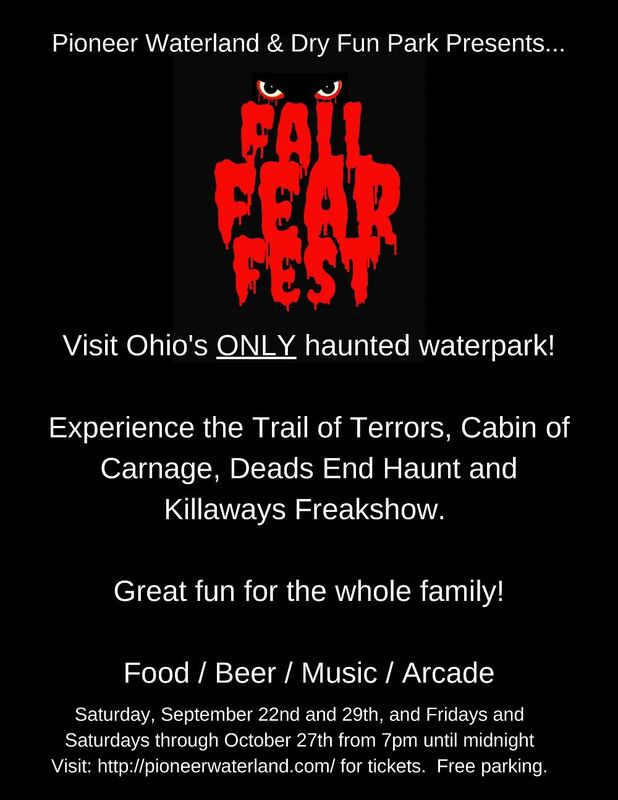 Lake Eerie Fearfest bands the mysterious legends of Lake Erie together under one roof to create the area’s newest, most unique, most feared haunted destination in all of Ohio. You don’t want to miss the nationally recognized Ghostly Manor, and all new haunted encounters brought in from around the world including Darkmare, Caged, Quarantine & Eerie Chateau! Lake Eerie Fearfest is 6 acres of non-stop haunted action. Took us over a hour inside this real limestone cave. It was a scare a minute meeting up with Devil himself. For the price and time spent it was well worth it being so unusal of a haunt. I am looking for a haunted house I can take my 7 yr old to that’s not childish. Any recommendations?